“My first and worse was when I was about 11. A teammate’s mother made slushies for all of us just after baseball practice. It hit like lightening out of nowhere. It was the worse headache I have ever had,” says Bennett Pourciau, a Keller Williams realtor who migrated to New Orleans from Baton Rouge after Hurricane Katrina. 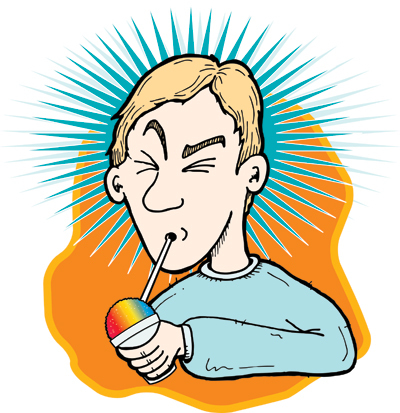 The snowball headache, aka brain freeze or ice cream headache in the rest of the world, is a yearly neurologic plague that reaches epidemic proportions each summer in New Orleans. Fortunately, it’s usually a 20 second or less headache with what physicians call no sequelae, meaning no long lasting complications. Pourciau’s description is classic. The inciting stimulus is icy cold and slushy rather than something frozen solid, say an ice cube. The onset is sudden but the discomfort is fleeting. Children quickly learn that prevention is easy. Gulping down a cold slurry of anything icy is the inciting factor. Prevention is simply allowing the cold substance to warm up a bit in front part of the mouth before propelling it towards the throat. “You have to sip, you can’t chug,” says Pourciau, sounding like Nell Nolan instructing youngsters on tea party etiquette, although it’s unlikely Nolan has never uttered the word “chug,” at least in public. “Sometimes I warn the tourists who come in and don’t know about New Orleans snowballs. The locals know all about snowball headaches,” says Michael Southall, the proprietor of Ice Cream 504 Uptown (2511 Jena St.). He notes that the cold-induced headache is an individual thing, as some folks have them and others don’t. Southall holds fort in a sleek and pristine single shotgun serving snowballs all year long to folks visiting the busy Freret Street corridor. In International Headache Society terminology, we’re talking about a “headache attributed to ingestion or inhalation of a cold stimulus characterized as short-lasting pain, which may be severe, induced in susceptible individuals by the passage of cold material over the palate and/or posterior pharyngeal wall.” It even has its own diagnostic code for medical billing purposes and lists ice-cream headache and brain-freeze headache as synonyms. Obviously those folks at the international headache headquarters don’t know about New Orleans snowballs, a local and not so hidden reservoir of this malady. For years, scientists who study such matters hypothesized that the etiology of these fleeting headaches boiled down to cold irritated nerve cells. The nerve pathway believers postulated that a sudden temperature drop caused a “cold shock” to a branch of one of the cranial nerves as it passes near the soft palate, that soft spot you can feel with your tongue at the back and top of your mouth. This drop in temperature angers usually silent nerve fibers that respond by firing headache producing pain signals to the brain. In the other etiologic ring, we had the blood vessel school. These scientists theorized it was all a physiological response involving regional blood vessels. Intense cooling of the soft palate causes constriction of nearby blood vessels. This triggers other blood vessels supplying the brain to counter react by dilating to maintain blood supply. More recent blood vessel and nerve research show each are partly right. When there is a sudden temperature drop in the back of the mouth, the blood vessels close to that area constrict decreasing blood flow. This causes the anterior cerebral artery, one of the primary arteries suppling the brain, to dilate, thus maintaining full blood flow to the brain. The brain has no pain sensors, but if the blood vessels swell in the covering of the brain, called the meninges, dilate, the increased pressure causes a headache. The spokesman for the dilating anterior cerebral artery is a branch of the trigeminal nerve. This is the cranial nerve involved with facial and motor functions such as chewing, biting, swallowing and temperature and food texture determinations in the mouth. Bottom-line: the snowball headache is a complex neurovascular event of summer triggered by a sudden temperature drop, reactive blood vessels and a cranial nerve generated pain signal that rapidly dissipates. Ice pick headaches, not to be confused with the snowball or ice cream induced ones, are almost as bad as they sound. This malady of a sharp and stabbing pain in the head around the eyes or temples isn’t related to consumption of cold food or drink. The pick in the name defines the stabbing-like “jabs and jolts” associated with this poorly understood headache diagnosis. Each “stabbing” comes out of the blue, lasting only a few seconds. There may be only one in a day or they can occur multiple times with irregular frequency. Ice pick headaches, officially termed primary stabbing headaches, often occur in persons with a history of migraine headaches. For stabbing pains lasting more than a few seconds, other diagnoses need to be considered, including trigeminal neuralgia, also called tic douloureux, one of the most painful disorders known in humans. “Brain freezes never stop me or even slow me down. I just wince and keep shoving it in and telling myself it’s not an aneurysm.” Carter Hooper, freelance copywriter, designer and former Mid-City resident now in California.